Did I get your attention? Are you furious? Concerned about the state of my immortal soul? Listening for the crack of thunder as God smites me with a lightning bolt? Or are you feeling suddenly insecure, worried I may be about to cast doubt on some of the truths that keep you sane? Or are there things you've been seeing and hearing about all your life, but never explored, and you'd like some help figuring them out? If you answered yes to any of those questions: good. That's exactly where I want you to be. Because the story I'm about to tell you is one of the most significant in the history of Western civilization, and how you interpret it will absolutely determine how you live through the Trump Era. Let's start with the truth: roughly two millennia ago, a baby was born to a Jewish couple somewhere in the Middle East. They named him Yeshua, a fairly common name, and raised him in their home town of Nazareth. As an adult, he became a traveling reformist preacher, attracted a large following, and was arrested and executed by the occupying Roman authorities. After his death, word spread that he had come back from the dead, then been taken up into heaven. His following grew, breaking away from Judaism and eventually becoming the state religion of the Roman Empire. To reiterate: that's the true part. Everything in the last paragraph historically happened. And now the not-so-true part, or at least, the part that cannot be historically verified: everything else about him. Yes, everything you know about Jesus, his birth, his ministry, his teachings, his death and resurrection, is utterly ahistorical, existing in the realm of faith, not fact. That doesn't mean it's false or fictional. But by the standards of any modern reputable news agency, there are no facts to check. No one who actually knew Jesus was interviewed about him or wrote a memoir about life with him. The writings that we do have came more than a generation after he left the mortal plane, and while they may have originated as stories told by eyewitnesses, they were at the time of the writing already so far removed from the actual events that they tell us much more about the identity of the persons who wrote them, and the communities in which they lived, than about the person of Jesus himself. This is nowhere more apparent than in the two stories of Jesus' birth, both of which I have appended at the end of this post. If you're not familiar with the actual writings, or haven't looked at them in awhile, you needn't take my blasphemous word for what's in them. Scroll down and read them for yourself. It won't take long, and it could just turn your world upside down. Both these stories are considered canonical: since the second century, the church has declared them to be indisputably the Word of God, essential parts of the Bible, despite the presence of contradictions. (Like ancient Judaism, early Christianity was more concerned with including powerful texts in its holy book than checking them for inconsistencies.) Reading Luke, you can't help but wonder what happened to the Star in the East and the Wise Men who followed it. Reading Matthew, you'll miss the shepherds and the angel chorus. There's also an extreme contrast in tone: Luke is hopeful, celebratory, and expansive, calling on the reader to share the good news that is for all people. Matthew, on the other hand, is filled with intrigue and danger, with an evil king scrabbling to hang onto his ill-gotten power, the implication being that this important news must be guarded and doled out judiciously, lest the authorities hear about it and try to stamp it out. With so many contrasts, you may be wondering: what actually happened? How could both the Fox News and MSNBC versions of this story be considered true? The answer is simple: when they were first told, nobody thought they were. Let me temper that with some context: the churches of Luke and Matthew probably had no contact with each other. They existed in different places, and for different reasons. Matthew's church was full of Jewish converts to Christianity who wanted to believe Jesus was the Messiah foretold by the Prophets, who would triumph over the corrupt puppet regime of Herod, as well as the far worse and more powerful Roman Empire, and bring about the apocalypse, bringing the entire world under the rule of God's Kingdom. Luke's church, on the other hand, was most likely a cosmopolitan blend of Christians from across the Empire, most of them Gentiles, who believed that God was already at work among them, transforming the Empire into an earthly manifestation of the Kingdom of Heaven. Matthew's church wanted Jesus to be in the line of King David, a righteous ruler who would fulfill God's ancient covenant with Israel. Luke's church believed Jesus had come to unite all humankind. Both churches cared for and advocated for the poor, and both saw Jesus as divine. Both also had a text: the gospel of Mark, a concise version of the life and teachings of Jesus that they probably found unsatisfying in its brevity and lack of details. So they wrote some fan fiction. That's not entirely fair, because what both Luke and Matthew did was far more than create new stories of Jesus. A good analogy would be what carmakers do with a good chassis. Take the Honda Accord, a car I've owned many versions of: in the mid-1990s, Honda built its first minivan, the Odyssey, on the Accord's chassis and engine. That same chassis, with a more powerful engine, was the basis of the Acura CL, a luxury sport coupe. Line up those three cars--Odyssey, Accord, CL--and you'd have a hard time believing they were all, at the most essential level, the same car. Take them apart, and the similarities would be readily apparent. That's how it is with the synoptic gospels: line them up in parallel columns, and one can't help noticing whole passages from Mark that have been incorporated into Luke and Matthew, or that all three gospels have almost identical structures. Other source materials have been incorporated into Luke and Matthew, and whoever put each of those gospels together added plenty of interpretive tropes as well; but at heart, they're telling the same story, if for different reasons. That's most glaringly apparent in the birth stories. Mark doesn't have one. (It also doesn't really have a resurrection story, though one was tacked on much later, probably in response to the resurrection narratives in Luke and Matthew.) That's a problem for the biography of a hero, the ancient form the gospels were using as their blueprint: the birth of a hero, demigod, or other mythical character prefigured the shape his life would take. So Matthew and Luke either selected (there were plenty of Jesus stories in circulation at the time) or composed nativity narratives that served their purposes. Both start with genealogies (which, compared side-by-side, have hardly anything in common), then move on to prenatal angelic visitations (in Matthew, it's Joseph who has the vision; in Luke, it's Mary and her older cousins), talk about the birth itself as almost an afterthought, detail the birth announcement (in Matthew to wise men, in Luke to shepherds), and conclude with foreshadowing: great and frightening things are going to happen because of the birth of this baby. To be clear: historically, none of this happened. And yet, in the eyes of these two early Christian communities, all of it was true. These stories grew out of their experience of who Jesus was to them, and so were in complete harmony with that experience. It rang true to their ears, so they made it part of their story. The untruth, the fiction, the fakery of this as good news comes later. Like their Jewish forbears, the early Christian leaders appreciated diverse ideas, and intentionally compiled a holy book that reflected that diversity. Only later (not much later, in the case of the church) did that diversity become an issue, as more authoritarian bishops took power and consolidated it by rooting out Christians whose beliefs deviated from their own. Heretics, they were called. Initially they were shunned; eventually, they were persecuted, tortured, murdered. Long, bloody wars have been fought over differing ideas about a book that, in its earliest versions, was a testament to diversity of thought and practice. This dynamic extends to something far more essential than even the survival of liberal democracy, or the ecological survival of the planet: the very nature of truth itself. Stories created 2000 years ago for the very specific spiritual identities of two unique religious communities have, almost since their invention, been mashed together and proclaimed as mortally true for all human beings, to the extent that the very existence of entire nations has hinged on whether they could embrace those stories as true. For most of the history of the United States, adherence to the literal truth of these stories has been a dominant feature of American religion. For a time--really just the last eight years--the people who most rabidly promoted that belief faded from the spotlight, and we of more liberal persuasions allowed ourselves to think the nation, as a whole, was becoming more reasonable, more logical, more fact-based. In the last year, those who embrace false news, mythology, conspiracy theories,and all manner of populist rumor-mongering have been empowered to hold onto both houses of Congress and to take the Presidency. And their messiah, far from being a humble preacher born in a stable, is a plutocrat who would put Herod to shame. which means, “God is with us.” 24 When Joseph awoke from sleep, he did as the angel of the Lord commanded him; he took her as his wife, 25 but had no marital relations with her until she had borne a son;[j] and he named him Jesus. 7 Then Herod secretly called for the wise men[o] and learned from them the exact time when the star had appeared. 8 Then he sent them to Bethlehem, saying, “Go and search diligently for the child; and when you have found him, bring me word so that I may also go and pay him homage.” 9 When they had heard the king, they set out; and there, ahead of them, went the star that they had seen at its rising,[p] until it stopped over the place where the child was. 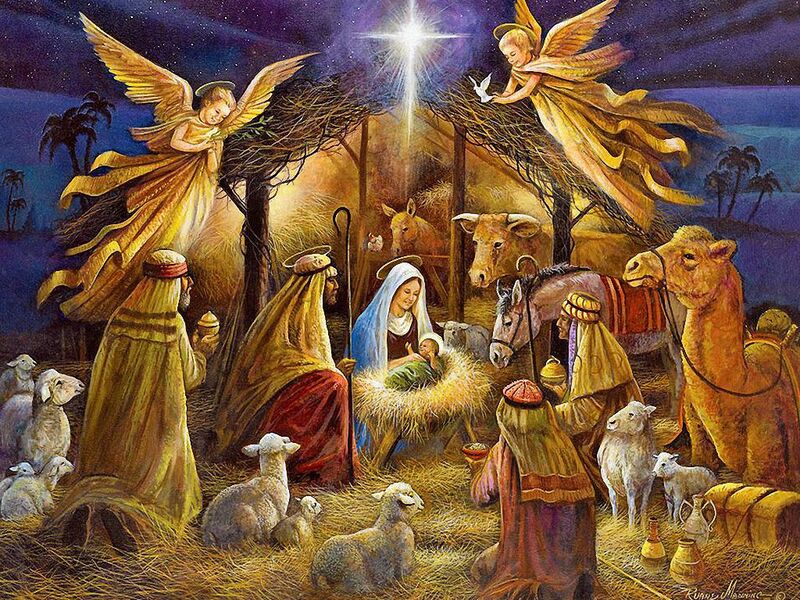 10 When they saw that the star had stopped,[q] they were overwhelmed with joy. 11 On entering the house, they saw the child with Mary his mother; and they knelt down and paid him homage. Then, opening their treasure chests, they offered him gifts of gold, frankincense, and myrrh. 12 And having been warned in a dream not to return to Herod, they left for their own country by another road.